If you've seen the movie, The Holiday, you have a bit of insight of how home swapping works—with the exception that it probably won't happen after two minutes of instant messaging or within 24 hours of the exchange. Home swapping is just as it sounds: You swap homes (and sometimes cars) with another person at no cost. But you don't want to hand your keys over to just anyone. A little homework is involved, including choosing the website you will choose to use for home swapping. 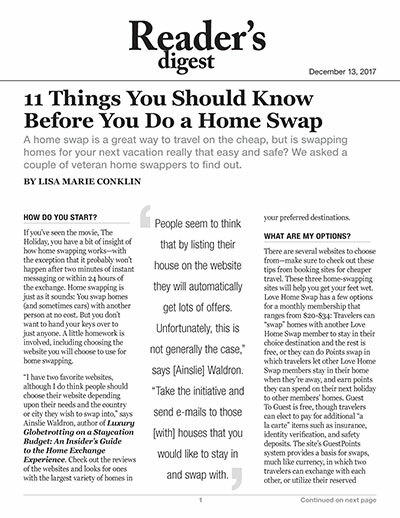 "I have two favorite websites, although I do think people should choose their website depending upon their needs and the country or city they wish to swap into," says Ainslie Waldron, author of Luxury Globetrotting on a Staycation Budget: An Insider's Guide to the Home Exchange Experience. Check out the reviews of the websites and looks for ones with the largest variety of homes in your preferred destinations. There are several websites to choose from—make sure to check out these tips from booking sites for cheaper travel. These three home-swapping sites will help you get your feet wet. Love Home Swap has a few options for a monthly membership that range from $20-$34: Travelers can "swap" homes with another Love Home Swap member to stay in their choice destination and the rest is free, or they can do Points swap in which travelers let other Love Home Swap members stay in their home when they're away, and earn points they can spend on their next holiday to any members' homes. Guest To Guest is free, though travelers can elect to pay for additional "a la carte" items such as insurance, identity verification, and safety deposits. The site's GuestPoints system provides a basis for swaps, much like currency, whereas two travelers can exchange with each other, or utilize their reserved GuestPoints. As soon as you list your home you get points and receive additional ones, depending on our location and size of the home. At Home Exchange, there is a flat membership fee of $150 which allows travelers to exchange homes with other members. It also includes a similar points system as the other two sites (called a balloon): People receive a balloon any time they host and can then use that balloon at a later time at any location and for any length of stay. Home swapping is a community of like-minded individuals who are looking for safe and comfortable houses to swap. Reputable home swapping sites will offer members ID verification. Just don't plan on doing the instant booking as you would on a rental site like Airbnb—here's what you should know about reserving a house on Airbnb, by the way. For your own comfort level, it's prudent to get to know to your swap partner first. "I do try to get to know the person I'll be swapping homes with," says Waldron. "I usually use Skype or Facetime to do this. It can be very useful to have a few chats beforehand for all sorts of reasons, like getting to know the area, getting to know each other, and having a better understanding of the house and environment." Sure, home swapping sounds amazing. You're saving hundreds on hotels, dining out, and have more room, but how do you manage to find a house to swap with on your timetable? Jamie Haley, of Los Angeles, California has successfully swapped homes for several years by being open to all home swapping offers that come in and decided if it can fit into her vacation schedule. Staying flexible when you travel is wise—check out these other tips for stress-free travel. "This has opened up a lot of destinations that were on my bucket list but I didn't have concrete timelines to visit," says Haley. By being open she's been able to travel to places like Hawaii, France, Australia, and Ireland. Consider joining a home swapping site where simultaneous and non-simultaneous swaps are an option. For example, if you were going to be staying with friends at a family cabin for a week, you could still offer your empty home to someone while you're gone. If you're swapping homes, chances are you'll need transportation for things like grocery shopping and sightseeing. Car swapping is often part of the home swap arrangement and Waldron has used car swapping often. "Most people manage to have us covered by their car insurance. We always provide a car for those who have provided us with a car. On a long trip this makes the vacation even more affordable," says Waldron. Cars can be left at the airport so a taxi isn't needed to get to the home or left in the garage at home. Just make sure to mention any little quirks your car may have to avoid frustration later. Yes, but not everyone will be eager to care for your fur baby while they are on vacation. Pet swaps or just taking care of a pet in their own home is something to seriously consider before agreeing to the swap. On one occasion Waldron did agree to take care of owner's pets. "We did one swap with a home that had two cats which had to be fed daily. It was really no trouble at all. Quite often people with pets tend to swap with people with pets and they can help each other," notes Waldron. "Similarly people with small children tend to swap with people with small children as they can swap car seats, toys, buggies and all the multitude of extras you need when traveling with small children." Speaking of kids, according to a survey by Babierge, a baby equipment rental company, the biggest hassles parents face when traveling are not having the equipment they need to keep their children safe, sleeping well, and enjoying their time at a hotel or out sightseeing. These are the items that can be lifesavers when traveling with kids! Babierge Family Travel Expert, Trish McDermott recommends having a conversation with the home-owners to find out if it's a family with young children—they may have all the essential equipment you need. Some things to ask about are stairs, safety gates, child-proofing, and whether the house has a pool with safety alarms or is in a high traffic area. Is there a playground or other kid-friendly attractions nearby? Are there cribs, highchairs, booster seats, strollers, toys, and books? Here are some creative ways to hide your valuables, but if you're a home swapper, it's more convenient to leave them in one place. "We created an owner's closet in our master bedroom that has a lock on it. I would definitely recommend a fire-proof safe to keep in the owner's closet for your very important paperwork," advises Haley. "Many experienced home swappers do this and in my experience, everyone is really respectful of this space in the home." Practice—and expect—all the habits of a good house guest; here's a primer on house guest etiquette. You'll want to follow general guidelines like no smoking in the house, of course. And you'll need to provide and get instructions for things like appliances and logging on to the WiFi. "The things that seem intuitive to you, like working the washing machine or dishwasher are actually quite confusing for someone else," says Haley. "By writing your own house manual and reading someone else's, you are ensuring that all the expensive items in your home will be operated properly." Emergency numbers, public transit, and places of interest are always appreciated when included in the house instructions. Waldron has noticed one common rule in many of the house manuals, including her own. "Help yourself to anything in the house, but if you finish something, please replace it. However, do not replace things you use if a portion of it is still available. For example herbs, soap, or all the little ordinary things that you use every day." Love Home Swap and Home Exchange say they rarely have cancellations, but when they do occur, the membership team is in place to find a replacement home. Haley credits her good luck with no cancellations to belonging to a home swap site that has paid membership. "It really weeds out those that aren't serious about home swapping," Haley says. Difficulties can often arise when traveling—here's how to plan for common vacation problems. Just because you have beautiful photos and live in a premier vacation destination doesn't necessarily guarantee an onslaught of offers. "People seem to think that by listing their house on the website they will automatically get lots of offers. Unfortunately, this is not generally the case," says Waldron. "Take the initiative and send e-mails to those houses that you would like to stay in and swap with."